If you are a regular follower of Rising Colors blog, by now you would know that I have a clean and minimal way of dressing. Too many accessories in one outfit is just not my thing. I opt for clean sophisticated look which has at least one statement piece. Sometimes I let the shoes speak, sometimes it’s the jewelery i am wearing and most of the time it’s the choice of my bag which screams attention in an outfit. You see.. what I mean..
P.S. 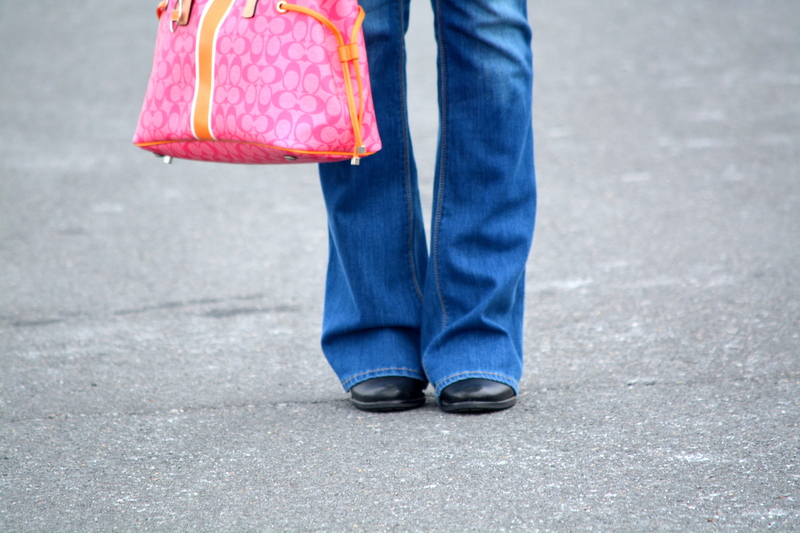 I am in love with these slim flare jeans. They add a good two inches to my height! Win.. win..!! Looking at these pictures, I feel brown is so under-estimated. I should play more with it! After all I am a fashion blogger and experimenting pretty much comes in the job description. Right? Anyways, this was one nice weekend with my beau. We were out and we clicked these pictures when the sun was about to set. I love sunsets. I hate getting blog pictures clicked in the dark or after sunset. I am a sun person (like a sunflower). My mood changes with the sun. If it’s not sunny today, you may want to stay away at an arm’s length from me. I could be sad, upset, cranky or angry! Don’t say I didn’t warn you! But.. if it’s sunny today.. oh boy I can be your best pal. I can be the happiest person on this planet! Till today only my husband knew this secret about me but from today I guess the whole world knows it. Enough of revealing my hidden secrets. Enjoy the pictures. This past week passed in the blink of an eye! As I mentioned in my last post, we spent it in Puerto Rico vacationing. And needless to say I am back – fully rejuvenated, refreshed and ready to take on the daily challenges once again! These pictures were clicked on the very first day when we landed. We quickly checked in to the hotel, changed clothes and walked down to the beach. The best part was the closest beach to our hotel was just a 3 minutes’ walk! We laid there for the rest of the evening as we were already tired from the long flights..
More pictures from the trip coming up soon! Keep watching this space..